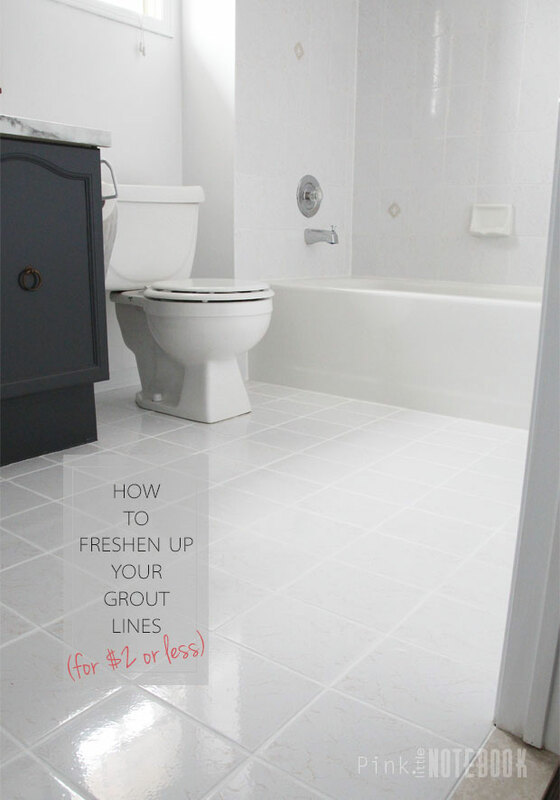 Looking for a quick, easy, and inexpensive way to freshen up your grout lines? 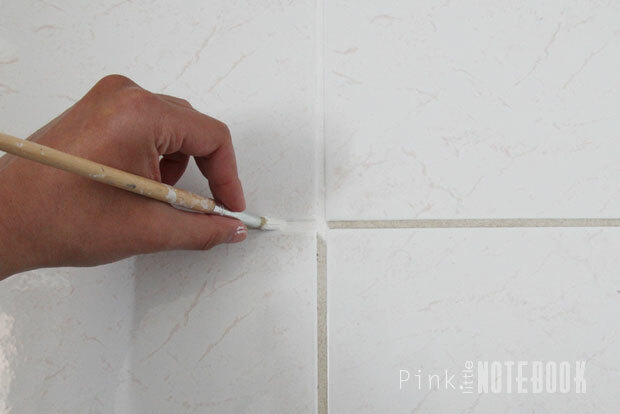 I’m going to show you how to change your grout colour for $2 or less! Our main bath is undergoing a very budget-friendly revamp. Since I’m not able to change tile at this time, I’m using a very simple yet effective method to make dated tile look like a new floor. Acrylic paint from the dollar store. Now I can’t take any credit for coming up with this brilliant concept. In fact, I got this idea from my bestie, Barbara, who in turn got the idea from her Mother-In-Law. 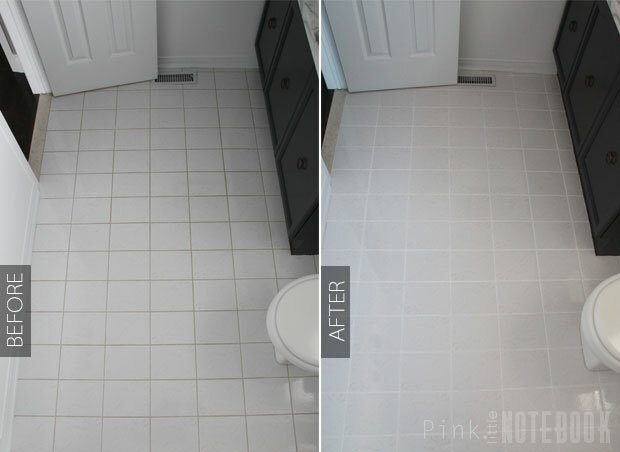 They both have painted grout in their own homes with amazing long-term results. I have used specialty grout paints in the past but majority of the paints you find on the market are epoxy stains with harsh fumes. With baby in the house, I definitely didn’t want to go that route. So I had to try this acrylic paint out for myself! I wanted to change my beige grout lines to white. This method does work best on sanded grout that has not been sealed as it has a porous surface that paint will easily absorb into. If you’re looking to cover discoloured grout, stained grout or if you just want to change the colour which is what I am doing, then this is a must-try. Vacuum and wash your floors. You need to start with a clean surface before you begin painting. Once the tiles are completely dry, use a fine paint brush and generously apply the acrylic paint to the grout in an even manner. If the paint touches the tiles, just take paper towel to it and wipe the excess off (without touching the grout lines). As you can see, my tiles have a pink vein going through them. 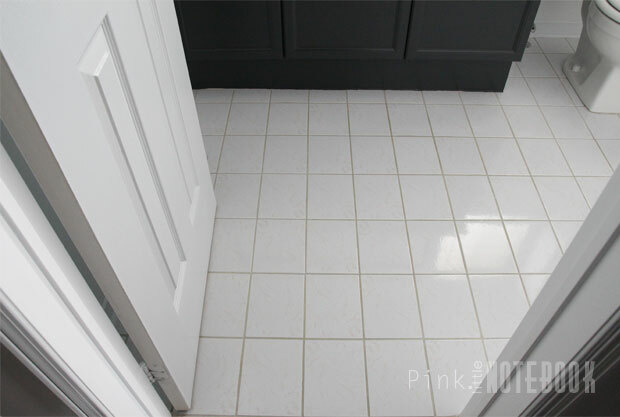 The great thing about changing the grout lines to white is that the eye overlooks the pink making the overall tile colour read as white. Isn’t the difference amazing?! Cover the entire surface and that’s all there is to it. You could take this one step further and apply grout sealer once the paint dries. This will ensure the paint is locked in for good. I have yet to do this, however, I must say a couple days after I completed this project, I did try to rub and scrape off the painted grout to see if anything would come off—it didn’t even budge! Although this is a time consuming project, keep in mind the larger the tile surface, the longer it will take you to complete but the results are totally worth it. Can’t go wrong with a $2.00 price tag. Thanks again Barb! UPDATE: Check out how we updated our old vanity and view the full makeover reveal here! What a great idea. We’re redoing our bathroom this summer. I’ll have to remember this. Looks a little time consuming but seems more than worth it in the end. This is such a fabulous idea! I have some lines I can’t clean at all. Definitely saving this post. oh gosh what a brilliant idea!! I am definitely going to try this. Has anyone else tried it? Your results? Thanks for sharing. I just did my front bathroom floor. I had ugly grout that had stains on it because our builder never sealed it. I followed her instructions and my floor now looks amazing!! I spent more on a package of paint brushes than I did on the paint and finished the job in about 1 1/2 hours! Total transformation! I used a stain for my Saltillo tile grout to make it dark. What a job but what a difference! I’m going to store today. I have tile in my kitchen & foyer, I am assuming I can use it there also. Right ?? Can this be used on a dyed grout? My grout was mixed pink. I hate it! !!! Super idea. Been looking for ways to make the bathroom grout look clean and white. Moping doesn’t do a think except make more dingy. Going to give it a go. You won’t be disappointment. I was so surprised with how good the end results were! Absolutely nothing! We mop the floors all the time. The paint absorbs into the grout so it’s very difficult to remove. This is one fantastic idea! I have a lot of white acrylic paint that is perfect for the master bathroom. We have totally remodeled our 40 year old home, but not the tile. I am so on this project and will my husband be surprised!!! Thank you Thank you Thank you! Earlier someone wrote they used a cleaner for the grout and it worked very well–it was a cleaner for mold/mildew. I have forgotten the name–would you please let me know. Thanks! We mop the floors all the time, The paint absorbs into the grout so it’s very difficult to remove. You can definitely add grout sealer to extend the life. I would be ticked off too but it’s fairly easy to seal on your own. Just time consuming. I have just read your tip on grouting and as I had some outdoor acrylic left over from my rock art, I decided to give some of the bathroom tiles a try. I’m delighted to say that they look great . I used white non drp paint a while ago, which lasted about 1 year so am keen to see how long it lasts with acrylic paint. Thanks for sharing. I have a darker pink grout on my kitchen tile which some are cracked but can I use the white paint or should I try to match the colors grout with the paint? I personally like white. It just makes everything look cleaner! Oh wow! What a difference it makes! This is genius! We actually have several areas that could use this trick! What a tedious project it must have been, but so worth it. Looks so fresh and new! Ok this is a brilliant idea! I never even thought of doing such a thing but it’s SO smart! I have a couple bathrooms that really need this done! My tile isn’t white, it’s like cream colored and tan grout. What would one suggest? will this work on the grout on the tile in a shower stall with showering each day? I did this,! After seeing your photos I knew I could do it on our kitchen floor that had the same time but with much darker grout. I painted the grout with the same wall color we used and after 3 days I have a beautiful new floor. Thanks for giving me the idea. Does the paint come off the tile if you get any on there? Do you have to use anything special to get it off? I suspect my hand will not be steady enough to stay in the grout lines all the way through! Thank you so much for this advice! I’m buying the supplies tomorrow.. Yes, the best part about this method is that the paint washes right off the tile but permanently sticks to the grout. As I was painting, I just keep a damp paper towel beside me and wiped anything that got onto the tile. Use Frog Tape on both sides of grout line. Later pull tape off and you will nice straight lines of painted grout. I kow there is a grout cleaner, a plastic bottle w a sponge tip to spread cleaner on the grout lines– i wonder if there is an acrylic bottle as such?! How did you get the tiles to shine? Hi Amanda, It’s just the type of tile I have. It has a polished finish to it. What about when you mop the floor afterwards when dried…does the paint come off when mopping? This method works best on sanded grout that has not been sealed. The paint will absorb into the porous surface therefore making it permanent. I mop my floors all the time and nothing comes off! Would this also work on kitchen counter top grout? Hi Jessica, if the grout lines are not sealed and have never been previously painted, it should work as well. Over hours with the results. Thank you so much for sharing! I was wondering how it would work in the shower area? Meant to say over joyed with the results. Makes my old tiles look brand new! If it’s sealed and you paint the grout, chances are it maybe peel or wear down very quickly. Maybe have someone take a look at it for you? Can this paint also be used on tile in the shower? It looks great. Thank you, thank you I have two bathrooms I need to do this in, (oh my aching back) haha, but I will get it done. Actually I wondered just last week if I could do that then tonight I see your post I’m so excited because my husband’s bathroom really needs it bad, so I will start there first. Again thank you for sharing. I gotta call my sis and my friends and tell them about this. I was painting the ugly orangey-pink bricks on my fireplace with a painting technique I found on pinterest. I used a pale taupe color flat latex wall paint by mixing equal parts paint & water. As I was painting the fireplace, I noticed the grout between the bricks soaked up the paint equally as well as the bricks. So I decided to try the same technique in an inconspicuous area of my ceramic tile floor…. it worked great!! 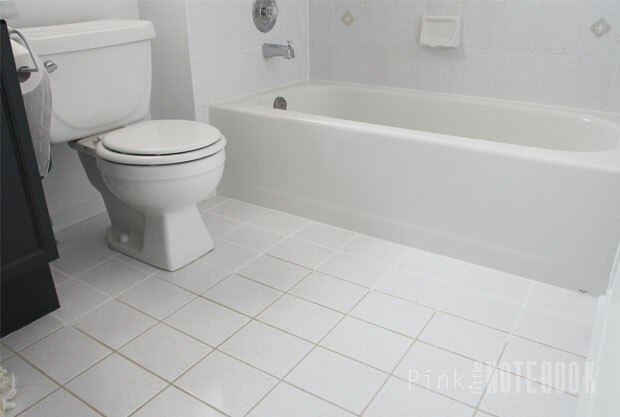 I plan on painting all the tiled areas in my house with a mixture of white/ivory paint & water to diminish the obvious grid pattern due to dark grout on the mostly beige/white tile floors. It will be so nice to walk into my house & see a clean & fresh looking white floor without the ugly dark grid pattern of the grout. What do you clean your tiles with , I generally use bleach is that okay? I normally use water and vinegar to clean my tiles. However, I have used bleach on occasion with no issues. I have painted grout several times. Just an FYI if you get paint on the tile. Let it dry and then wipe off with a Mr.Clean sponge. Works great and does not affect the painted grout. For $10 I would use the “epoxy” grout sealant colorant at Home Depot. It is formulated by chemists to penetrate, seal and color grout. Arcylic craft paint may work well initially, but you know it is designed to paint christmas ornaments. You may be sorry down the line. Why risk it? I have used grout recolour kit in the past (I linked my tutorial at the beginning of this post). Funny enough, one of the main ingredients in these colorants is acrylic paint! It’s been a year and half and my bathroom floors look exactly the same after using acrylic paint. I personally prefer this route, does not smell as bad and the results are the same. Glad to see some recent comments on this thread! I just found it the other day, and decided to paint the grimy grout in my rental kitchen/hallway/bathroom! Luckily it’s a fairly small space, so after about 1.5 hours of work last night I am about 1.4 of the way done I’d say. Can’t wait to see the end result! It is already looking promising. ;Just bought an older home with chipped tile and old grout, will use your method for painting my grout. Hint for fixing chips I found on YouTube: Acrylic nail polish from a discount store. Clear polish to fill deeper chips and holes, and white polish and a color close to my tile color. Use the corner of a rolled up paper towel as your brush to mix the colors on white cardboard to match to your tile. If you have a duller tile surface as I do, you can pick up a “matte finish” clear polish at any drugstore if it’s not at the discount store (most clears are high gloss). .
My husband tells me I’m nuts for wanting to do this to my grout. Can you give me an update on how your bathroom tiles is holding up? All the other way to paint grout seems super time consuming and expensive! I want to use your method!! I’m being 100% honest when I say it looks exactly the same as the day I painted it. Good luck! Thank you for this post. I have a small amount of glass block in my bathroom. The grout was really grungy. I painted it today and it looks as good as a glass block wall possibly could. 8-). Glad to here Lisa! It makes all the difference, doesn’t it!?! This is really a tremendous idea. I never even thought of doing such a thing but it’s useful. I have a couple bathrooms that really need this done. And i am going to do this in very next time. Thanks for the sharing your great article with all of us. How long did the paint need to dry? Hi Nikki, it dries fairly quickly but I would give it a day to be on the safe side. This could be just what I need. Will this work in a shower? Hi Regina, I have never tried this technique in the shower. I probably wouldn’t recommend it though as there’s just too much moisture in the shower area. Would you recommend slightly sanding the grout lines first? I’m unsure if they are sealed or would a deep cleaning suffice? Wouldn’t it just make sense to clean your grout with a scrub brush and grout cleaner. I mean…. come on. Acrylic paint will just come off in balls eventually and you still have dirty grout. Not to mention…. the paint won’t stick to a dirty substance very long. I’m just sayin….. I’m sure no one will read this or care to but the first reply I saw at the top said what a great idea and I thought WHAT????? Paint a dirty surface. Does that mean you don’t plan to mop either. READ THE POST PLEASE! I never once mentioned that I had dirty grout. So I’m not sure why you are assuming that??!!?? 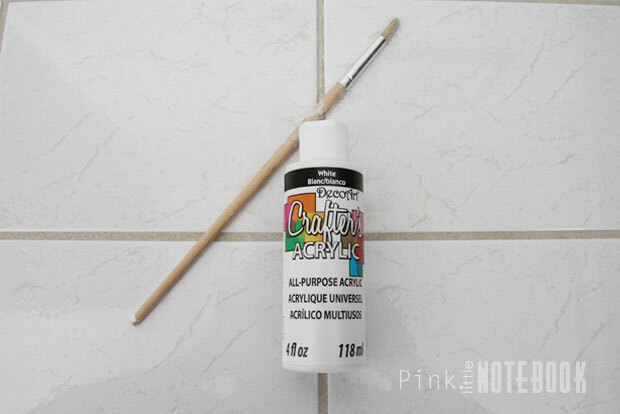 This post is about CHANGING THE COLOUR of your grout. And FYI, it works amazing! Hi Sabrina! You’re grout looks amazing! I’m currently in the process and the paint over my gray grout is uneven… do you have to do several coats to make it look good? I used dollar tree acrylic paint so maybe the quality? I’d love any suggestions!! Nope, my grout only required one coat. I had sanded grout that was not sealed so it absorbed the paint right away. Thanks for responding! It does soak in but it’s sort of transparent? Like I can see the gray through it. I think I’ll try paint from a craft store and see if it holds up better. Fingers crossed! Love this idea! Could you use it on your shower floor tile do you think? As long as you let it dry long enough after? Hi Michelle, this product is not recommended for floor tiles. I just want to thank you so much for this great, inexpensive idea! I have black tiles on my countertop, and have always disliked the white grout. Hard to keep clean, and so noticible. I bought black acrylic paint and painted the grout. It makes such a huge difference! Now you notice the tiles, instead of the white, stained grout. It’s made my countertop look so much better, thanks again!